A friend and I went for a short hike in the snow on New Years Day at F. Gilbert Hills State Forest. We accidentally spooked a deer that was laying down about 20 feet off the trail - we never would have even seen it had it not jumped up and ran away. After that, we decided to track it through the snow to try to get some photos. 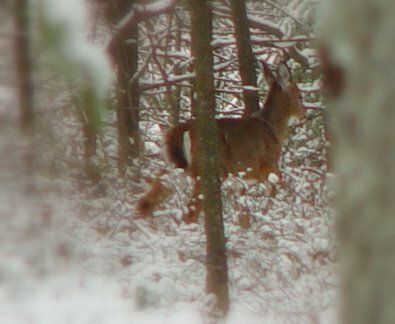 Unfortunately, I forgot to charge the battery on my camera, so I only got this one blurry picture of the deer before the battery ran out of power. I also didn't notice until afterward that I had accidentally put the camera in manual focus. Considering that, I'm surprised the deer is even recognizable in the photo. For a much better photo of the same deer, check out Rob's site here. It was a very fun time trying to creep along quietly in the snow, following tracks through brush and small pines. There were a few times we were able to get fairly close to the deer before it spotted us and ran further away. Eventually we had to call it quits as it was getting dark. That must have been fun....Rob's pix is awesome!!! !